Many newcomers and visitors arrive with the misguided notion that Austin has a desert-like climate. Technically speaking, Austin has a humid subtropical climate, which means it has long, hot summers and typically mild winters. In July and August, high temps often top out at around 100 degrees Fahrenheit (38 degrees Celsius), sometimes for several days in a row. The humidity is usually only at sauna-like levels just before a rainstorm, but even when it’s not raining, the humidity rarely dips below 30 percent. Due to the generally mild climate, allergy season lasts all year. In May and early June, spring rains can turn the area’s rivers, streams, and even dry creek beds into raging walls of water. Several dams control the flow of the Colorado River through the city, creating Lake Austin and Lady Bird Lake. But even these flood control systems can get overwhelmed when the storms move slowly over the area. Adding to the danger, many smaller streets traverse low-water crossings over normally timid streams. Most water-related tragedies in Austin occur at these low-water crossings, leading local officials to promote the slogan: “Turn around, don’t drown.” The cities and counties in the region operate a constantly updated website that displays the current status of low-water crossings. In recent years, extended droughts have been more common than heavy rains. In 2013, the water level at Lake Travis dropped so low that many lakeside restaurants found themselves 100 yards or more from the water. Floods in 2015 significantly improved the lake levels, and many of the shuttered businesses reopened. Continued heavy rain in 2016 has sustained the lake levels and led to an economic boom in the Lake Travis area. In August 2017, Hurricane Harvey devastated Houston and much of southeast Texas. Austin and Central Texas received torrential rain but minimal wind damage. The drenching rains, however, had a delayed effect on many of the trees in the areas. Weeks and even months after the hurricane, trees started falling over without warning. The nonstop rain over several days had loosened the root systems and served as the final death blow for trees that already were in failing health. Such weather extremes can also affect home foundations and underground pipes. As the ground shifts, concrete foundations and pipes can move and crack. Spring in Austin starts quite cool in March, but by May, temperatures are almost summer-like. While March and April are usually dry, May is Austin's rainiest month, typically receiving upwards of 4 inches of rain. Combined with the rising temperatures, this can make for some unbearably muggy and humid days. Still, spring in the Texas Hill Country is generally beautiful, with long sunny days and ample wildflower blooms appearing everywhere. What to Pack: Bring lightweight clothing as if you were packing for summer, along with a jacket if you're visiting during early spring when nights are still cold. An umbrella and waterproof clothing is a must for heavy spring thunderstorms or rain showers. 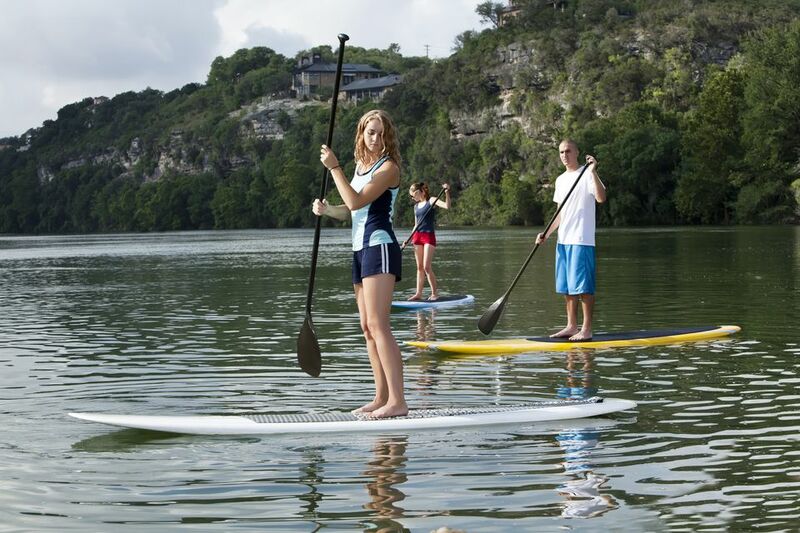 Austin's sizzling summer kicks off in June and is in full swing by July. Temperatures exceeding 100 degrees Fahrenheit (38 degrees Celsius) aren't uncommon. Thunderstorms are also a regular summer occurrence, typically in the afternoons due to heat buildup. Don't expect cooler temperatures at night either—lows during the summer months rarely dip below 75 degrees Fahrenheit (24 degrees Celsius). What to Pack: Pack as light as you can—think shorts, T-shirts, tank tops, and of course, a bathing suit. Sunscreen and sunglasses are also a must in the scorching Texas sun. After summer's scorching temperatures, locals love celebrating the milder temperatures of the fall. The weather during this time of year averages in the 70s F. Fall is a great time for outdoor activities as it's warm, but not unbearably so. Some mornings and evenings can be cooler, and there is occasional rain, averaging nine days per month. What to Pack: For early fall, summer attire is still appropriate, such as shorts and T-shirts. By November, you'll want to pack layers, such T-shirts and light sweaters. Jeans are also appropriate for most of the fall. Winters in Austin can be surprisingly cold but are usually still warmer than other parts of the country. High temperatures can reach into the mid-60s, but lows can dip into the 40s, or sometimes even below freezing. Snow isn't incredibly common, and the sun is typically shining on most winter days in August. What to Pack: Pack a warm jacket for evenings, as well as some rain gear, including waterproof shoes, an umbrella, and a raincoat. The underground geology of much of the Austin area is made up of limestone. This porous stone develops pockets over time, which can develop into underground water sources known as aquifers. Cool, refreshing water bubbles up from the Edwards Aquifer to create Austin’s most famous swimming pool, Barton Springs. The three-acre pool in the heart of the city maintains a constant temperature of 68 degrees Fahrenheit (20 degrees Celsius) year-round. Because of the steady temperature of the water, many regulars swim year-round at Barton Springs. The water doesn't feel nearly as cold when the air temperature is also in the 60s.